The University of Louisville College of Business Equine Industry Program released the following analytics brief, “Modeling the Dynamics of the Supply of Registered Thoroughbred Foals and Animal Health,” by applied economist and associate professor Steven Vickner. The present study builds upon the research of the academic thought leaders of the past, but with more recent data available from the online Jockey Club Fact Book and other sources of annual economic data. A dynamic panel data methodology was used in this study with 36 regions covering the U.S., Canada, and Puerto Rico. A model excluding Puerto Rico and another model focused just on the U.S. were also estimated with nearly identical results to the full 36-region model. Accounting for the lag structure of the model, there were 19 years of data per region ending in 2016. Recall, there is a two-year grace period to register a foal hence 2016 was the last full year of actual data. All of the drivers of foal supply were highly statistically significant and maintained the expected directionality that the laws of economics would dictate. 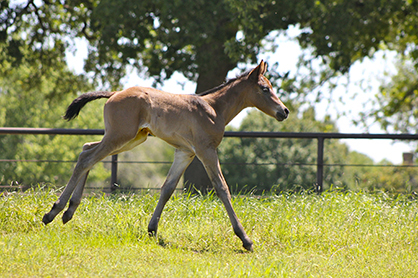 The model also corrects for heteroskedasticity, which is important given foal production varies geographically. Future research efforts in this vein of analytics will also consider the impact of owner/breeder incentive programs pending data availability. Additionally, related studies will address the key drivers of the real price of yearlings over time, such as the health of the business cycle as measured by changes in real GDP, exchange rates, real purses, and the number of races to mention just a few. Shannon Neibergs and Richard Thalheimer. “Price Expectations and Supply Response in the Thoroughbred Yearling Market.” Journal of Agricultural and Applied Economics 1997, Vol. 29, pp. 419-435. Dr. Steven S. Vickner is an economist and associate professor in the Equine Industry Program, College of Business, University of Louisville. He earned both his MS and PhD in agricultural and resource economics from Colorado State University, an MBA in management from the University of Denver and a bachelor’s degree in economics from Bowling Green State University. His research focuses on the role of information and technology on economic decision-making, and he has done years of extensive work studying yearling Thoroughbred prices. He teaches Equine Economics, Equine Marketing, and the senior capstone project course in the EIP, as well as Data Analytics II in the new MS in Business Analytics Program. For more information, contact Vickner at (502) 852-4888 or steven.vickner@louisville.edu . The Equine Industry Program at UofL is the only AACSB-accredited undergraduate business degree in the world with an equine focus. Graduates can be found in all aspects of the industry, from training to broadcasting to financial analysis.